Milwaukee 2429-20 Cordless Sub Compact Band Saw is part of the collection off Milwaukee Power Band Saws that are capable of one-handed cuts so clean you'd swear the material was cut in a factory. It specifically cuts rebar like butter and serves as a great too for cutting support rods and conduit, particularly if you're in need of more flexibility because the item you're supposed to cut is located in a tight or confined space, such as a drop ceiling. When using this machine, pay close attention to your cuts because you don't want the LED light to throw off your straight cut. You should make the features and benefits improve rather than hamper your work but thankfully, once you get used to the Milwaukee 2429-20 Cordless Sub Compact, everything should fall into place. That's certainly the case with me. Compact size and a lightweight device overall. Easily allows one-handed cuts every time. In three seconds, it can cut a ¾-inch EMT. XC battery allows 150 cuts every charge. Some units only work intermittently. What Benefits Should This Band Saw Have? A band saw is supposed to be something that's supposed to give you more flexibility in cutting compared to a table saw and whatnot. That's what I was looking for when shopping for such a saw. I wanted something that can do small cuts that you can't do with scroll saws, radial saws, circular blade saws, or even chainsaws. I wanted something that could be considered a jack-of-all-trades in the realm of band saw. Then again, that's supposed to be a feature present in all band saws. It's the inherent advantage of this saw type, if you will. Therefore, to get the cream of the crop when it comes to band saws themselves, I set my standards pretty high. I've tried out many a band saw and judged their performance in terms of their cut capacity and the amount of cutting applications I can get out of them. With that said, I'm also aware that there's a bit of an exchange between cordless band saw's mobility and cutting strength. The more cutting strength I want out of my saw, the less cutting capacity I can get out of it. I have to make that compromise. So this time around, I set my sights to getting the most mobile and lightweight band saw I can buy without sacrificing too much on its cutting capabilities. According to reviews, there are construction workers, maintenance mechanics, and other industrial-level people who depend on the Milwaukee 2429-20 Cordless Sub Compact Band Saw. You also have your butchers, woodworkers, homeowners doing home improvement work, metal fabricators, and timber cutters. However, it's mostly people involved in construction work that require quick cuts that depend on the Milwaukee 2429-20. This makes perfect sense in light of how portability makes up a major selling point for the 2429-20. Many workers depend on this machine and its two wheels rotating its blade into the same plane to ensure the most controlled and sharpest cut imaginable. I particularly favor it because it's able to outperform certain top brands out there (more on this down below on the alternative choices section). It's just as sturdy and strong as any other top band saw out there, but it's able to outdo them as well because of this device's user-friendliness and true portability. For something to be portable, it takes more than just being lightweight. It should also be designed to not be unwieldy when you wield it. Its batteries are also long-lasting to ensure extended usage. There are certain benefits that every band saw should have. Here are some of them. Although the Milwaukee 2429-20 band saw's main claim to fame just happens to be its compactness and maneuverability because of it, being compact in general is an important aspect to band saws. Sure, there are stationary band saws in existence, but they've also been made mobile thanks to the huge advantages of such. I personally think that a band saw should be versatile. It doesn't necessarily need to be able to cut through absolutely anything, especially since a baretool portable band saw should balance out mobility with cutting capability, but it should have a modicum of power to justify its smallness and better maneuverability, or else you'll defeat the purpose of minimizing it. Your band saw choice depends on what you're going to use it for. Maintenance mechanics, construction workers, and metal cutters both require stationary band saws for thicker material cutting and portable band saws for cutting material that cannot be moved or disassembled from the area they're placed. You can pick between a cost-effective band saw that has few options included (like the LED light as a cutting guide and a means to see what you're doing) or find something that has all the trimmings (like one that includes the variable speed trigger or the integrated hanging hook). When it comes to the specific things to take into consideration when buying band saws, here they are. The size of your band saw is determined by its wheel diameter. The throat width is then known as an inch less than the wheel diameter. This also defines the widest board that you can pass between the column and blade. Small shops should have at least 14-inch band saws but 16-inch ones are better. The 18-inch to 20-inch machines is responsible for industrial-grade heavy-duty work. For versatility, get saw with at least a 12-inch resaw height. The two main types of band saw are the stationary ones and the portable ones. The Milwaukee 2429-20 is cordless mainly because it's portable, lightweight, and battery-powered so that you won't have to worry about cords getting in the way of your work. You might instead need a stationary band saw instead for heavy-duty 18-inch to 20-inch work pieces. What are you going to use your band saw for? If you wish to utilize your band saw for the sake of cutting through various materials in a one-handed fashion with a cordless machine that keeps the cord from getting in your way, then the Milwaukee 2429-20 Cordless Sub Compact Band Saw is the perfect saw for your needs. If you need deeper yet clear cuts above the 1⅝ inch cut capacity, you need something a bit bigger and heavier yet still mobile. The Milwaukee 2429-20 Cordless Sub Compact Band Saw, like many band saws of its kind, is powered by an electric motor and a battery with charger (sold separately). Thanks to its 150 cuts per charge, 1⅝ inch cut capacity, and 6.6-pound weight, you have something you can wield like a bulky knife or sword in order to cut with amazing precision and depth normally reserved for table saws. Let's now review the specific features and benefits you can expect from the Milwaukee 2429-20 Cordless Sub Compact Band Saw. With that said, even though you can safely wield and use the Milwaukee 2429-20 one-handed for superior dexterity and versatility with your cuts even at small or crowded areas, that doesn't mean it should lack in the power department or have an XC battery that lasts only as long as 15 minutes or so. You want something impactful as well as handy. Naturally, when dealing with one-handed use, you should have a cordless band saw certified by the Occupational Safety and Health Administration. You don't want to have an uncertified band saw on hand that claims you can control it one-handed but isn't really capable of such feats, especially in light of how easily it can cut through pretty much anything. The battery and charger is sold separately because this is a baretool package rather than a kit. However, it does have your requisite LED light highlights that give you a cut line guide of sorts and up to 150 cuts per charge. It's recommended you buy the charger, battery, and carrying case unless you want to save money and you have these available separately at under $50. Lightweight and compact size allows for cutting in tight spaces with depth and precision reserved for stationary saws. You can wield the machine one-handed without losing control of it. It's capable of cutting a ¾-inch EMT in three seconds, so it has a cutting capability of a table saw minus the limited cutting options. You're given 150 cuts every charge from the XC battery. The cut capacity of 1⅝ inch is good enough for a band saw of this size and weight. The LED light can throw off your straight cuts if you don't use it carefully and with ample presence of mind. Here's the good and the bad I've seen when it comes to the reviews about the Milwaukee 2429-20 Cordless Sub Compact Band Saw. There's only a scant few reviews that are truly critical or negative of the Milwaukee 2429-20, and these usually come from reviewers who ended up getting a faulty unit that intermittently stops or one without normal paperwork (like warranty and registration). I found this quite promising indeed, especially since Milwaukee has such a positive reputation in the realm of band saw. It's one of the most commonly cited brand names and it is right up there with the DEWALTs and Makitas of the industry. The unit itself has few complaints other than the typical lack of a battery included as a kit or the LED light being used properly so that it serves as a benefit rather than a detriment. Many reviewers agree that the band saw cuts through everything like a hot knife through butter, maybe even like a laser through butter. It might not have as high a cutting capacity as other band saws, but that's the trade off to its smallness. It's like having a knife versus a sword, but the knife is big enough to do most things that a sword could without being too unwieldy or large to use in confined spaces. The reviewers agree that it's an excellent tool for places where everything is done in conduit and you need to regularly cut ½-inch and ¾-inch EMT every time. Other than that, the reviewers of this machine agree that it is indeed one of the safest and most controllable one-handed band saws out there. I've also gathered some alternative choices in case you're in need of more power versus more maneuverability out of your band saw. There's not much to hate about the DEWALT DCS374B 20V. It has a high cutting capacity of 5 inches that's only outdone by WEN 3962 Two-Speed Band Saw's 6 inches. However, in turn, the WEN 3962 outweighs the DEWALT DCS374B by a whopping 57 pounds. This implies that the DCS374B efficiently uses its bulk more, like a flatscreen showcasing comparative picture results to an old-school CRT screen. It has all the requisite features of a baretool band saw of its class, from an integrated hanging hook to an LED work light with a 20 second delay. It also features a variable speed trigger for superior control and cutting accuracy. Meanwhile, there's the Makita XBP02Z 18V Portable Band Saw. It compares favorably with the DEWALT DCS374B, which means it's also outdone by the Milwaukee 2429-20 Cordless Sub Compact Band Saw in terms of compactness at the expense of cut capacity. It also features great comfort, durability, and speed for a band saw of its class. The Makita XBP02Z has a more extensive variable speed control dial with six settings compared to the DEWALT DCS374B, but it kind of falters in other specs like cutting capacity (DEWALT's 5 inches versus Makita's 4¾ inches). Then again, the XBP02Z is lighter than the DCS374B, but in the end the Milwaukee 2429-20 proves itself the most lightweight of the bunch. As for the DEWALT DCS371B, it's a bit of a step down compared to the DEWALT DCS374B in terms of both cut capacity (the DCS371B is only capable of 3½ inches of cut capacity) and weight (the DCS371B weighs a whopping 37.9 pounds, making it the second heaviest band saw on this list). But it does have a more centered design and belt tracking adjustment. With that in mind, why would you buy the DEWALT DCS371B if it's a downgrade from the DEWALT DCS374B? It's all about the price! The superior DCS374B costs $329 while the DCS371B costs only $199. With that said, even though the Milwaukee 2429-20 cannot outdo either DEWALT product in terms of cut capacity; its one-handed maneuverability trumps all! The SKIL 3386-01 2.5-Amp 9-Inch Band Saw is the second heaviest band saw on this list, which makes it questionable why I'd even bother comparing this unit to the Milwaukee 2429-20 Cordless Sub Compact Band Saw. It seems like they belong in different weight classes, like Sugar Ray Robinson versus Muhammad Ali. With that said, pound-per-pound, which is better? The much-vaunted mobility of the Milwaukee 2429-20 gives it the edge against the SKIL 3386-01, but the latter does have 3½ inches of cutting capacity versus only 1⅝ inch. However, for some, the reduced cut capacity is a good tradeoff for better maneuverability. For others, the SKIL 3386-01 has enough portability and compactness to justify its more-than-twice capacity in cutting accuracy. As for this heavyweight, it's on a class of its own. The heaviest portable band saw on this list has specs for days to more than make up for its bulkiness, such as a 3.5 amp motor that cuts at a capacity of 6 inches deep and 9¾ inches wide. It's also capable of using blades from ½ inch to ⅛ inch. It also operates at two speeds of 1,520 to 2,620 RPM (versus the six speeds of the Makita XBP02Z). It's able to outdo the cutting capacity of the DEWALT DCS374B but at the expense of being significantly heavier than the DCS374B, so it's many magnitudes away from the league of weight lightness that the Milwaukee 2429-20 Cordless Sub Compact Band Saw belongs to. Buy what you need. Do you value one-handed lightweight band saw action for all the hard-to-reach spaces and hard-to-cut areas filled with pipes, shelves, or other obstacles that limit your hand movements? Then you should definitely invest in Milwaukee 2429-20 Cordless Sub Compact Band Saw. Sure, it's outdone by all of its competitors in terms of cutting capacity, but in turn none of them could even get close to the compactness and lightness of the unit (the closest one that could challenge its 6.6 pounds of weight is the DEWALT DCS371B and its 10.2 pounds of weight). 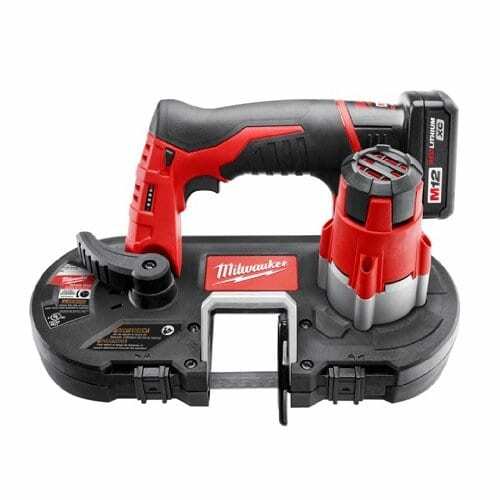 The only real downside to it is that there are other more powerful band saws out there, but none of them are as small and surgically precise as the Milwaukee 2429-20, so there's a definite trade-off between raw power and compactness that even the reviewers of this power tool recognize.